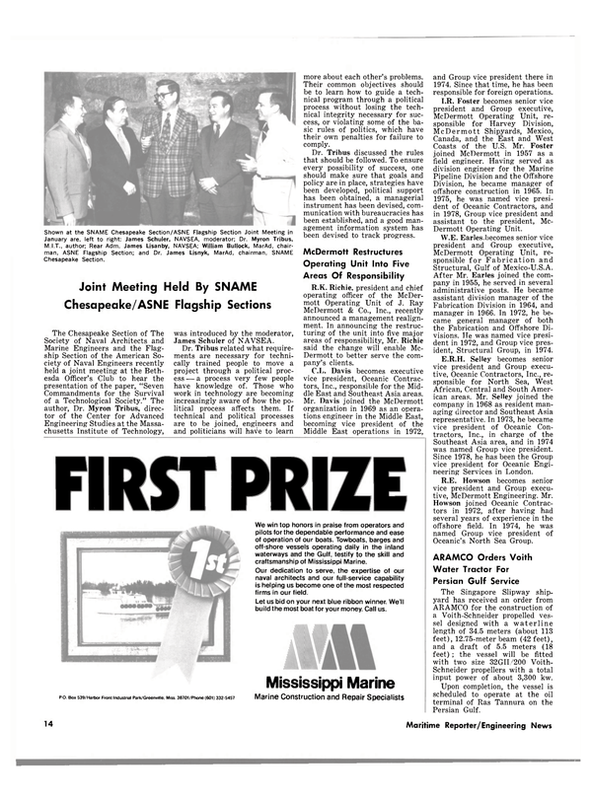 The Chesapeake Section of The Society of Naval Architects and Marine Engineers and the Flagship Section of the American Society of Naval Engineers recently held a joint meeting at the Bethesda Officer's Club to hear the presentation of the paper, "Seven Commandments for the Survival of a Technological Society." The author, Dr. Myron Tribus, director of the Center for Advanced Engineering Studies at the Massachusetts Institute of Technology, was introduced by the moderator, James Schuler of NAVSEA. Dr. Tribus related what requirements are necessary for technically trained people to move a project through a political process -— a process very few people have knowledge of. Those who work in technology are becoming increasingly aware of how the political process affects them. If technical and political processes are to be joined, engineers and and politicians will hav^e to learn more about each other's problems. Their common objectives should be to learn how to guide a technical program through a political process without losing the technical integrity necessary for success, or violating some of the basic rules of politics, which have their own penalties for failure to comply. Dr. Tribus discussed the rules that should be followed. To ensure every possibility of success, one should make sure that goals and policy are in place, strategies have been developed, political support has been obtained, a managerial instrument has been devised, communication with bureaucracies has been established, and a good management information system has been devised to track progress.